The Henrico County Historical Society reached 500 likes (and counting) on our Facebook page. If you haven't already done so, please like our site and encourage your friends to do so as well. We can never have enough friends who support Henrico County history! On the HCHS Facebook page you'll see posts on what is currently happening regarding Henrico history, special events, and help from our research committee with your inquiries. Our volunteers are busy at work and we thank them as well. One recent item of importance is the Federal recognition of six Virginia tribes finally approved, after almost two decades of their effort. The six Indian tribes that were granted federal recognition were the Chickahominy, the Eastern Chickahominy, the Upper Mattaponi, the Rappahannock, the Monacan, and the Nansemond. It is to be noted that some of the recently recognized tribes were once part of the Powhatan confederation of tribes. It is thought the location of what is now Tree Hill Farm was possibly Paramount Chief Powhatan's birthplace. It is an honor and a privilege to have served on the Henrico 400th Anniversary 2011 Commemoration Advisory Commission, American Indian Committee with Wayne Adkins, First Assistant Chief for the Chickahominy Tribe and president of the Virginia Indian Tribal Alliance for Life. You may have seen photos of Wayne in regalia at Henrico Historical Park, the site of which represents the second successful English settlement in America from which Henrico County traces its origin, named after Henry, Prince of Wales of England. Even though the two cultures clashed at times, a temporary peace agreement was accomplished as a result of the marriage of John Rolfe of Henrico and the daughter of Powhatan, Pocohontas. Ths site of Henricus, originally part of the Henrico Couty, was annexed by Chesterfield County in 1922. A small portion of the site is designated as part of Henrico because of its origin, but that is mostly forgotten along with other annexations of Henrico by the City of Richmond. We hope you can join us for our first meeting of 2018. The speaker will be Ida Annette Minor Ward. 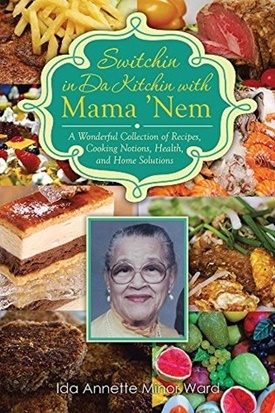 She has written a very popular cookbook, Switchin' in Da Kitchin with Mama 'Nem, as a tribute to her mother. Her cookbook contains many heirloom recipes. Ms. Ward is a recipient of the Historic Preservation Advisory Committee's "Award of Merit". And we will sample some of Ms. Ward's recipes. Doesn't that sound yummy?! Our March meeting will be held on Sunday, March 4, 2018, starting 2:30PM. It will be at the Belmont Recreation Center, located at 1600 Hilliard Road in Henrico, VA 23228. Our speaker will be Ida Annette Minor Ward. She will speak about her cookbook, Switchin' in Da Kitchin with Mama 'Nem." Ida Annette Minor Ward is a retired teacher from Henrico's J.R. Tucker High School and a coordinator of the American Institute for Foreign Studies. Her cookbook is a tribute to her mother. This is a collection of preferred recipes, crafts, and household ideas submitted by friends, family members and neighbors as well as culinary treasures from Annette's kitchen. Please join us for her presentation. 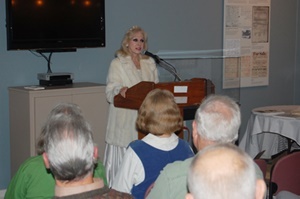 Long time Miller & Rhoads Snow Queen Donna Deekens entertains society members at the December meeting with the story of Bill Strother and her memories of the Miller & Rhoads Christmas experience. Malvern Hill Farm, where American troops served during the American Revolution, the war of 1812 and the Civil War, has remained mostly unchanged since the Civil War and will apparently stay that way, thanks to the cooperation of a number of federal, state, and local agencies and nonprofits. The Capital Region Land Conservancy has closed on a $6.6 million deal on the 871-acre farm. Plans involved the transfer of 412 acres to Henrico Couny, which put up $1.5 million to acquire that portion, the transfer of 12 acres to the James River Association for a canoe/kayak launching site on Turkey Island Creek and adding 380 acres to the Richmond Battlefield Park. The first owner of the land was Richard Cocke, who named the property for Malven Hills in England. The farm was purchased in 1939 by William Ferguson, whose descendants have decided to sell it, setting the stage for this important conservation project. In April of 2017, the Historic Preservation Advisory Committee recognized brother and sister Tim Liles and Susan Nunnaly, representatives of the Liles family, for the family's work in securing the preservaton of the Crew House, a nineteenth century landmark adjacent to Malvern Hill Battlefield. Also recognized was the The Civil War Trust, who worked with the family and bought the aforementioned Crew House, recorded an easment on the proerty and donated the property to the county. Battle of Malvern Hills fou[ght] on Tuesday July 1st in which the federal forces gained a complete victory over the rebel army, led by Genl's Magruder and Jackson, Alfred R. Waud, 1 July 1862. Invoking so the cypress glades? Ah wilds of woe! Our Henrico County forefathers were, it seems, a rather inventive lot, procuring patents for any number of inventions. William O. George, who was featured in the March 2016 newletter, invented a useful imprement for uncoupling railroad cars as well as a rather whimsical game table whose purpose was to facilitate bashful lovers in expressing their affection for a young lady. 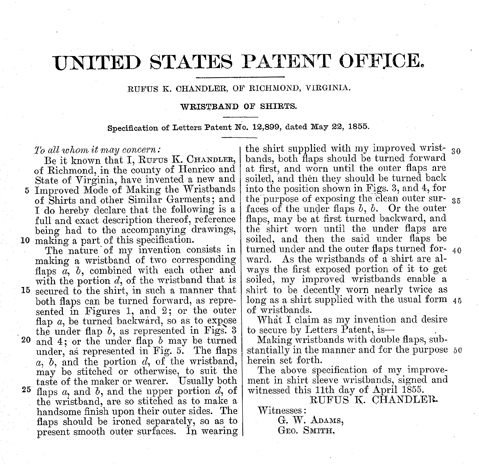 We are beginning a regular series featuring patents acquired by Henrico citizens. 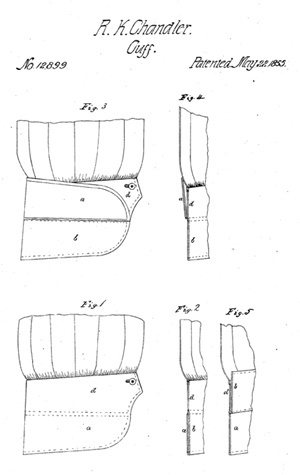 We will start with Rufus K. Chandlers' 1855 invention of an improved wristband for shirts. You can decide where it falls on the useful to whimsical spectrum. Housed in the Virginia Historical Society, an 8 1/2" x 7" 42-page notebook on lined blue paper contains the minutes of the Virginia Light Dragoons from August, 1854 to May, 1856, the first year of the outfit's reorganization. It provides a sketchy view of the volunteer group's activities, but more importantly, it makes one want to know more about them. From her earliest days, Virginia found it necessary to rely on counties to provide military troops. In 1676, the General Assembly responded to Indian attacks by providing for a general levy of a thousand men, of whom seventy-five were to form a troop of dragoons. Then in 1680, men in each of the counties were invested with the power to summon the body of militia to arms when a pressing need arose. In Henrico and Charles City, that man was Colonel William Byrd. As time wore on, Henricoans served in various military bodies, including the 33rd Regiment of Militia, the Richmond Light Infantry Blues and the Henrico Light Dragoons - also known as the Henrico Troop. By 1850, however, the Richmond Enquirer in a May 31 article headlined "HENRICO TROOP" complained that "It is a subject to many citizens of the county that this old corps has, to all appearances, ceased to exist." It went on to note: "The city of Richmond has as many as six volunteer companies in commission, one other in course of organizations - seven in all - or, almost an entire regiment; whilst the large county of Henrico, bounding this city on three sides, and fully as much in need of this kind of security is entirely without a single armed company, and entirely at the mercy of lawless vagabonds. The seed of reorganization lay dormant for four years until, as the Daily Dispatch announced in a June 20 article that "This company [Henrico Troop] is being rapidly organized, and will, very probably have its first public parade on the 4th of July." It was being formed under the leadership of James Lucius Davis, whom the Dispatch dubbed "a man, admirably qualified by intelligence, education and experience in the field, for the post to which he has been unanimously called." 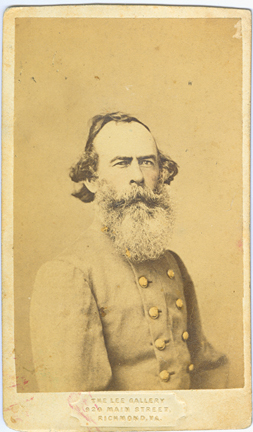 Davis was a graduate of West Point, had served in the US Army as a Lieutenant in the 4th US Artillery and had served with the Rangers in Texas. Pictured left is James Lucius Davis. First captain of the Henrico Light Dragoons. The company's minute book opens with the heading "Subscribers to the Constitution of the Henrico Light Dragoons." A list of 61 names follows, the first 46 of whom were apparently charter members, and the remaining having joined between October 19, 1855 and December 13, 1856. At its initial meeting on August 9, 1855 at Goddi's Tavern, Capt. Davis was "called to the chair. The minutes name the 16 members who were present and recorded a motion passed to have 'Collector Green' (listed as a Private in the minutes roll) be furnished with a list of absentees for collection of fines." By September 13, 1855, the dragoons met again at Goddin's Tavern and were ready to stage their own version of a quite popular military/social event - a tournament - to which "Knights from each County in this Congressional District to be invited." Such tournaments were grand affairs, recreating Medieval tournaments featuring jousts where, as stated in A Companion to the Literature and Culture of the American South put it, "knights with noms de guerre out of Scott's novels...rode at each other with 11-foot lances, trying to spear a ring about the size of a bracelet." The book goes on to note that "Scott was the planters' favorite writer, the provider of an embellished vocabulary for their romantic nationalism." Mark Twain even joklingly referred to the antebellum South as "Sire Walter Scottland." This assessment seems borne out well by an account of a tournament held at Amelia Springs for the Henrico Light Dragoons in 1858, that October 8, 1858 Richmond Enquirer article is signed "Ivanhoe." Pictured is a drawing from the September 1875 edition of Harper's New Monthly Magazine illustrates the action in a ring tournament. The planning for the newly reorganized dragoons' first tournament began on September 22 when the group met to plan the tournament. It has to be at "The Fair Grounds" and "each person [was] to be charged 50 cts. entrance fee." There would be a parade at 10:00 a.m., and "Riding would commence at 1/2 past 3 p.m...Crowning to take place immediately after the riding on the Grounds." That crowned "knight" would also have another honor. As the October 6, 1855 Daily Dispatch noted in an announcement of the tournament that it was "to be followed on the evening of the same day by a GRAND SOIREE [i]n honor of the chosen Queen of the Victorious Knight" - also called in an announcment on the day of the tournament as the "Queen of Love and Beauty." That same article noted that the affair would be "contributing to the festivities of the approaching anniversary of the capitulation of Yorktown," and it had a long and detailed account of the proceeding of the day. Included was an outline of the joust: "Each Knight shall have three chances. In the event of a bad start, the Knight will promptly lower his point, seeing which the 4th Marshall will order the recall to be sounded; but three failures either in start or at the ring, or in speed, will forfeit further privleges. All charges shall be exacted." The following day's Daily Dispatch account of the results opined that "During the 'tilting' some admireable horsemanship was displayed, but we saw no one who sat so firmly in his saddle and bore his lance with such study, unerring aim, as the Knight 'Don Quixotte'." He had bested the other horsemen with names including the Knight of Scarlet Guard, of Mount Vernon, of Fairfield, of Rose Lawn, of Sydney and others. Those names, in some cases, seem to identify the homes of the various "knights." The minute book of the Henrico Light Dragoons identifies the winning member saying, "the occasion passed with a great deal of eclat. Trooper Ruben A. Lacy was the successful Knight-taking the ring six times consecutively." Proceeds from the tournament were given to the Mount Vernon Society, and the minute book records a total gate of $665,000 and a total of $424.04 in expenditures, allowing the Dragoons to write a check to the Mount Vernon Society for $200.00. That gift inspired a letter of thanks whose florid language rivaled the language of the day's journalism and the affair's pageantry. 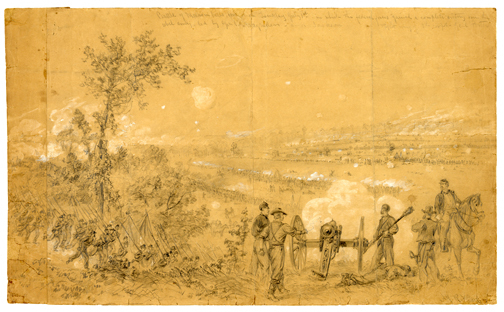 The letter to Captain J. Lucius Davis said, "By the valuable contribution thus rendered to the patriotic enterprise of the ladies of the union to save from desecration the Homestead of the Father of Our country and secure from disturbance the hallowed spot selected by himself for the repose of his mortal remains, the gallant corps with you have the honor to command have by their loyalty, gallantry and patriotism, won for themselves the gratitude and admiration of all who held in veneration the memory of Washington as he is not, and we trust ever shall be 'first in the hearts of his country men'." The tournament became a yearly affair, and the next year saw the Henrico Light Dragoons holding one of the Fair Grounds in Petersburg. Once again, Rueben Lacy took the crown, this time as the Knight of Dragooons. Of the 23 participating knights, the Daily Dispatch of November 8, 1856 says that "only 4 tilted equal to gain the honors." The knights of Dinwiddle, Prince George and America joined Lacy honored knights by "having lanced the ring two consecutive times, at a speed varying from 4 to 6 seconds within the distance of an eighth of a mile. Lacy chose Miss Ella Enniss of Petersburg as Queen of Love and Beauty. The troop held yearly tournaments and participated in numerous parades over the next few years. 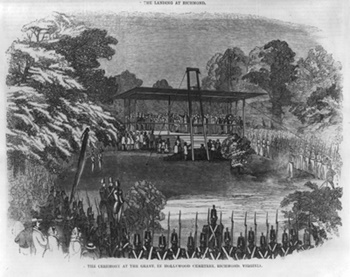 On July 4, 1858, the Henrico Light Dragoons were one of the many military troops that participated in the reinternment of President James Monroe when his remains were moved from New York to Hollywood Cemetery in Richmond. Among those troops was the New York 7th Regiment. Less than two years after their collaboration in this event, those groups would find themselves on opposite sides in the Civil War. The Henrico Light Dragoons would become Company I, 10th Regiment, Virginia Cavalry; and the Confederate cavalry would use James Lucius Davis's The Trooper's Manual or Tactics for Light Dragoon and Mounted Riflemen as a handbook. Pictured above: Monroe reinterred. The Henrico Light Dragoons participated in the ceremonies depicted in the July 1858 Harper's Weekly. The History of Henrico County, Louis H. Manarin and Charles H. Peple. Institutional History of Virginia in the Seventeenth Century, Philip Alexander Bruce. The Literature and Culture of the American South, Richard Gray and Owen Robinson, eds. 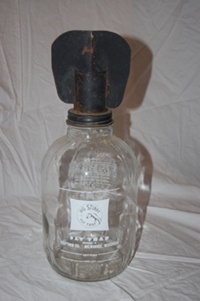 Congratulations go to Mary Jo & Haywood Wigglesworth and Ken & Terry Murphy for identifying the glass object as a fly trap. 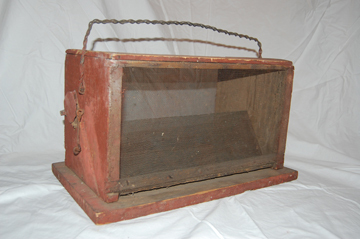 Ken and Terry have a modern one they use by baiting with vinegar to keep away fruit flies. Our object, however, is a bit older. 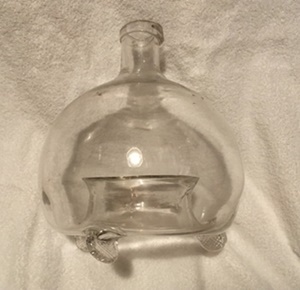 It's a late eigtheenth or early nineteenth century handblown trap. Sugar water was placed in the bottom, and a cork was placed in the top. Attracted to the sugar, flies flew under the trap and into it, and found escape impossible. This was a rather elegant solution to a problem, and the object itself was also quite elegant, quite unlike the others pictured here. To the right is a wooden and screen affair which featured an open cone of screen inside the screen box. 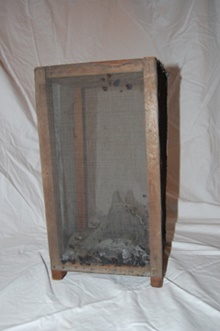 Like the glass trap, flies flew under the box and then up through the cone into the baited area where they were trapped. The other wooden trap was a good deal larger - 18" long, 10" wide and 12" tall. It may have had a more commercial use to manage the fly population in a country store. 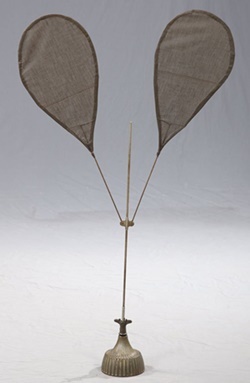 It worked on the same principle, but rather than a cone, it has a long v-shaped screen running down the middle wth multiple holes for entry at the apex of the "v". The last trap shown is a contemporary trap for a barn. Its manufacturer apparently had a sense of humor, illustrated by the trap's name - Big Stinky. It relies on what must be an odoriferous bait the company sells. Insects fly into the vanes and fall into the jar. Finally in our group is a metal Victorian clockwork shoo fly. Once the device was wound up, the paddles, which could be spread out farther, would gently spin around, thereby "shooing" the flies away from the dining table. Preheat oven to 400 degrees F and line a pie dish with the single crush pastry. Or you can use store brought, but isn't there something lovely about rolling out the dough yourself? Therapeutic, even? No? Combine all the ingredients for the crumbs in a bowl and cut the butter into the flour mixture with a pastry blender or fork until it resembles coarse crumbs. You can also use a food processor but it hardly seems worth the cleanup effort. In a small bowl dissolve the baking soda into the boiling water then mix in the molasses and then the egg, whisking to combine completely. Layer the molasses filling and crumbs in alternating layers ending with the crumbs. I did three layers. Bake pie in preheated oven for 10 minutes, and then reduce the temperature to 350 degrees F and continue baking about 20 minutes or until the filling feels like jello when pressed. It should be firm but still have some give. Just remember: it will get harder as it cools! Cool at room temperature. Serve with whipped cream or vanilla ice cream. Here's a little different item that may or may not have a connection to Henrico County. Do you know what it is, what is was, and where there's another one? Email your answers to jboehling@verizon.net.